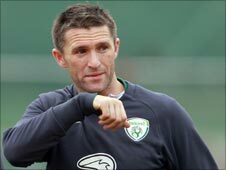 Robbie Keane is back in the Republic of Ireland squad for the forthcoming Euro 2012 qualifier against Macedonia and the friendly match against Uruguay. Keane was one of several players who missed the Carling Nations Cup win over Wales in Dublin last month. Shay Given remains an absentee with a shoulder injury so Coventry goalkeeper Kieron Westwood is expected to deputise for the Manchester City stopper. Manager Giovanni Trapattoni has named a 29-man panel for the two games. Keane, who returned to action for West Ham as a substitute in Sunday's 2-1 FA Cup quarter-final defeat by Stoke, was selected after recovering from a calf injury. Richard Dunne, who found himself in the headlines for the wrong reasons over the weekend after a disagreement with Aston Villa coaching staff, is also included as he continues his recovery from a shoulder problem which was expected to sideline him for a month. The Republic lie second in Euro 2012 Qualifying Group B, two points adrift of leaders Russia. Trapattoni's team host Macedonia at the Aviva Stadium on Saturday 26 March, followed by the friendly against Uruguay on Tuesday 29 March. Republic of Ireland squad: Westwood (Coventry City), Randolph (Motherwell), Forde (Millwall), Foley (Wolves), O'Shea (Manchester Utd), Clark (Aston Villa), Coleman (Everton), Dunne (Aston Villa), St Ledger (Preston North End), Kelly (Fulham), O'Dea (Celtic), Kilbane (Huddersfield Town), Wilson (Stoke City), Gibson (Manchester Utd), Whelan (Stoke City), Green (Derby County), Lawrence (Portsmouth), McCarthy (Wigan), McGeady (Spartak Moscow), Treacy (Preston North End), Andrews (Blackburn), Fahey (Birmingham City), Duff (Fulham), Keane (West Ham), Walters (Stoke City), Doyle (Wolves), Long (Reading), Best (Newcastle), Keogh (Bristol City).